General News Announcements / Dimensional Death community Rules Updated. 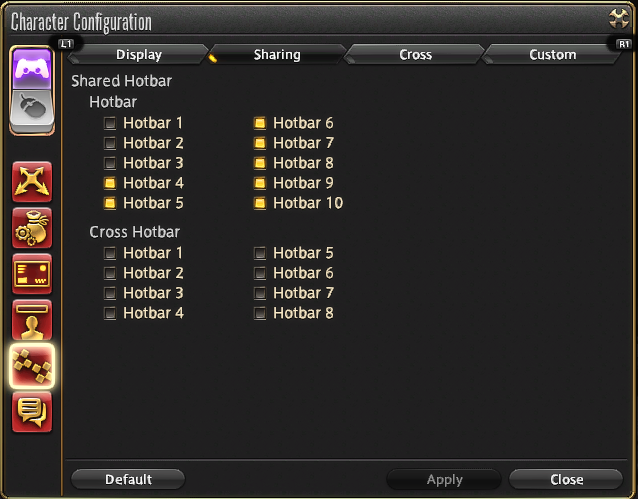 Here's a small guide for those that want to make a Dynamic Hotbar. 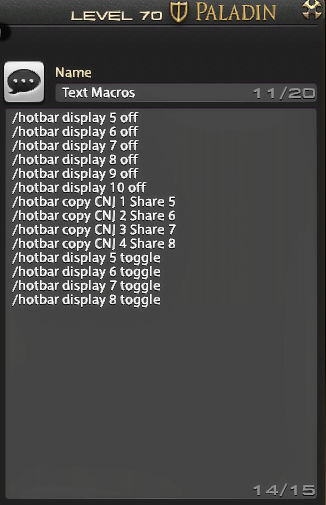 The Classes and Text macros are essentially using the same 4 HotBars, but swapping their contents to Classes or Text Macros depending on which button is pressed. This isn't as hard to do as it seems! You can apply this is a multitude of ways. 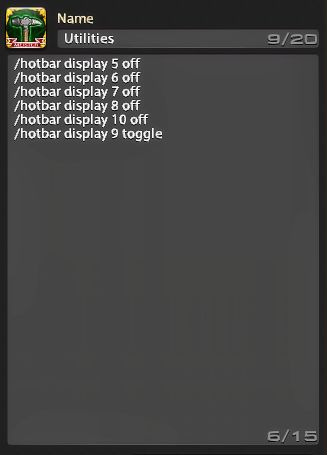 The utilities and Waymarks use their own separate hotbars because they are tied to Hotkeys. 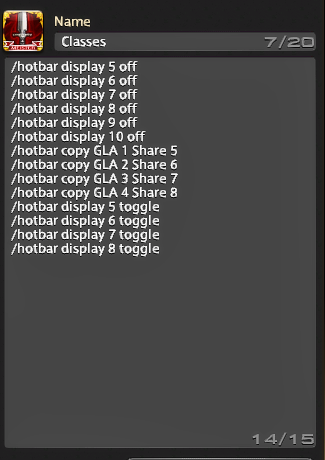 The thing with Hotkeys is that they are tied to the specific Hotbar number you assign them to, so if you change the contents you also change what your hotkey would do. So I make them into 'static' ones rather than dynamic like the Classes and Text ones. That way I can use the 'utilities' to setup things like mounts, minions, spring and what not, something that any class would use. Same with waymarks, assigned to the NumPad. So how to make this? It's not that tough! Set up those you want to use as 'shared'. Setting them as not shared means they change with each job. Make sure they are set as 'shared' BEFORE you start placing any actions on those bars, otherwise they will stay with the class you're currently on. Also set their size in what suits your needs. 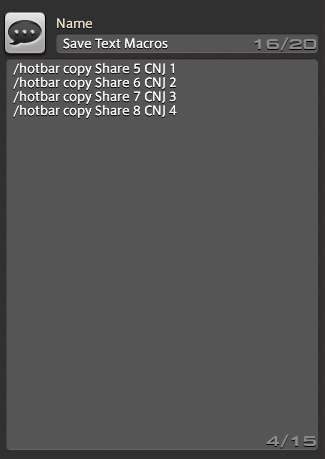 In my case I set them up as 4x3 for the 4 hotbars I use for Class/Text, and 12x1 for the 'menu' bar. 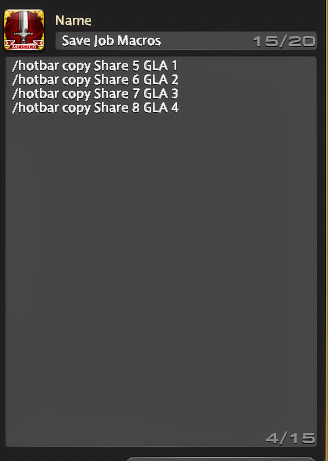 I stacked them up like this, using Shared 4 as the menu, 5-6-7-8 as the Class/Text, 9 for Utilities and 10 for Waymarks. I also placed them so that they appear 'above' the menu button. Since pressing one makes the other vanish, they can be overlapped like this. Now for the User Macros. 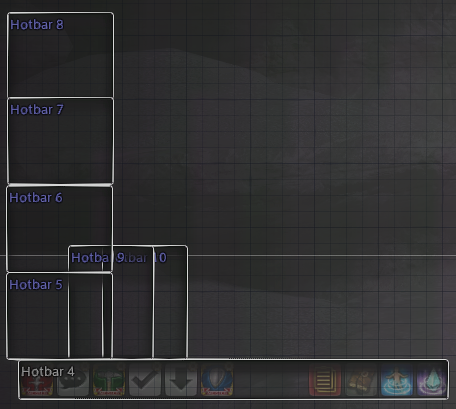 This basically saves each 'Share' (5-6-7-8) to GLA 1-2-3-4. Why Gladiator? Because it's a class, and classes are saved separately than Jobs. And once you unlocked jobs you don't have much of a reason to use classes anymore, so they are generally safe to use. Just don't save it unto a class you might level up later if the job is not unlocked! Avoid saving to jobs for the same reason of course. And put the 'save' macro somewhere there. That way if you ever make changes to the layout later you have a quick access to saving it. 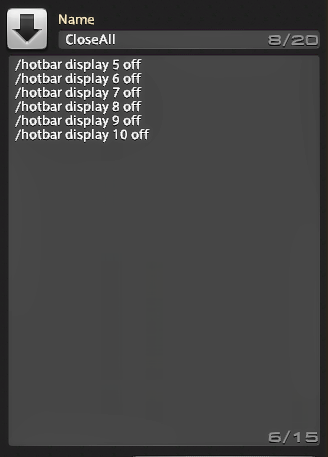 If you don't save, all changes will be lost when you 'load' those hotbars up, of course (making an improvised Undo while at it). In this picture, the 'save' is in the lower right corner. 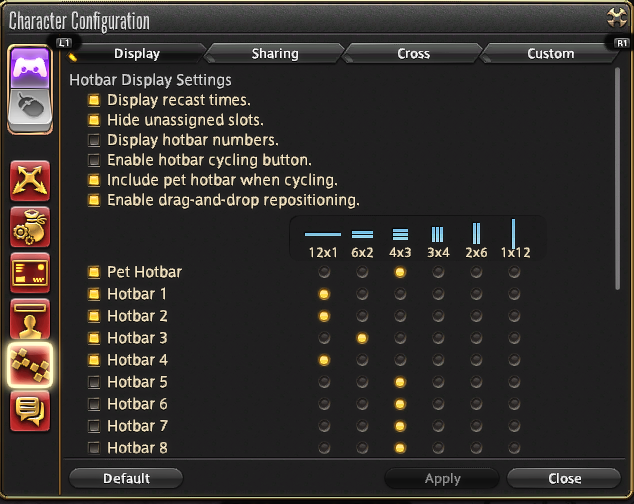 This basically removes ALL visible hotbars (display off) then pulls up the bars GLA 1-2-3-4, puts them into Shared 5-6-7-8, and then displays them back on. This avoid seeing the icons vanish and reappear oddly, but also hides other menus like Utilities and Waymarks (9 and 10 for me). And that's it! This is the logic to apply to any dynamic hotbars. Simply adjust this to your needs, you can make a single 'rotating' bar with up/down arrows for example, scrolling through various choices instead of using a menu bar like mine. 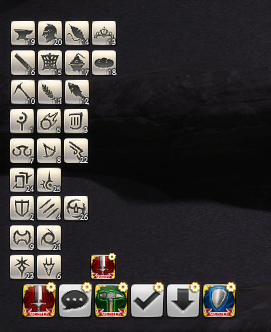 The idea is to save/load the bars to Classes and Display on/off/toggle as needed. Not that complicated! General News Announcements / Re: [DD10] What's your fondest memory in Dimensional Death?